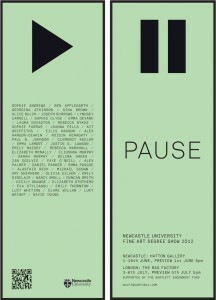 I will be exhibiting work at the Departure Foundation North East Student Prize. 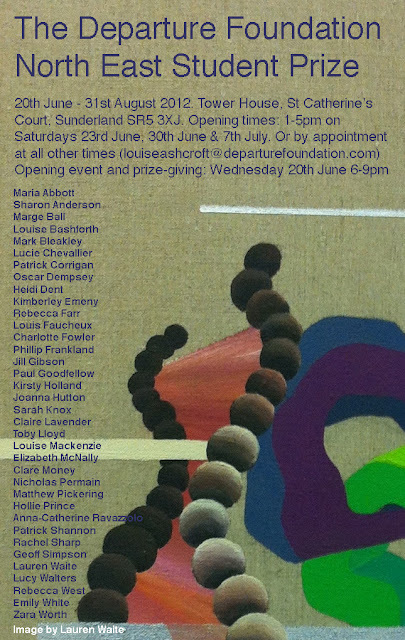 The opening event and prize-giving will be on Wednesday 20th June 6 - 9pm. The show runs until 31st August 2012 and can be viewed Saturday afternoons 23rd June, 30th June and 7th July 1-5pm, or by appointment. Newcastle University’s Fine Art Degree show opens tonight and will be open until 16th June. It will then move to at The Rag Factory, 16-18 Heneage Street, London from 3-6th July. I have seen the students work progress over the last two years and am really excited about seeing what they have produced for their final exhibition in the department.